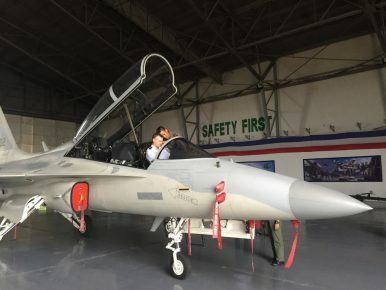 Last week, the United States and the Philippines completed the latest iteration of a new exchange between their two air forces established last year. The move is just the latest example of the defense cooperation still ongoing between the two longtime allies despite the complications that have arisen since Philippine President Rodrigo Duterte took office last June. As I have noted in these pages, the United States and the Philippines have a decades-old alliance that was formalized in the Mutual Defense Treaty in 1951 and a long history of security collaboration (See: “The US-Philippine Alliance Under Duterte: A Path to Recalibration”). Though the environment for security cooperation has been more uncertain amid Duterte’s initial pursuit of a so-called ‘independent foreign policy’ – diversifying Manila’s alignments away from Washington and towards other powers like China and Russia – important collaboration in areas like counterterrorism and maritime security is still ongoing, albeit with some of it more quietly pursued (See: “US Terror Aid to Philippines Signals Enduring Defense Ties Under Duterte”). That includes cooperation between their air forces as well. In recent years, both sides have set up annual Airman-to-Airman (A2A) talks and the Philippines had agreed to host more U.S. Pacific Command and U.S. Pacific Air Forces (PACAF) exercises as well as related missions and air contingents. The uptick in collaboration has allowed Washington to increase its regional presence and enabled Manila to get the kind of support and expertise that it badly needs given its own limitations (See: “Where is the Philippines’ Air Force Modernization Under Duterte?”). As just one example of this ongoing collaboration, last year the U.S. Pacific Command, with the approval of the Philippines, established a U.S.-Philippine Air Contingent with exchanges and other related activities facilitated by PACAF. According to PACAF, the objective of the exchanges, held quarterly, is for both services to share technical and operational expertise and develop standardized training and practices in various areas that can help streamline cooperation and boost interoperability. The first U.S.-Philippine Air Contingent occurred in April 2016, and both sides have maintained the quarterly schedule up to this point. Previous iterations have featured open forum discussions and subject matter expert exchanges along with bilateral training missions and some drills featuring U.S. personnel and equipment. From August 16 to August 25, the two sides conducted the fifth iteration of this exchange. According to Pacific Air Forces, 25 U.S. Air Force Airmen participated in subject matter expert exchanges (SMEE) with their Philippine counterparts at various military installations throughout the country, including Clark Air Force base in Pampanga. PACAF said in a statement that the exchanges would cover various topics including precision guided missile and munitions operations, command and control tactics, humanitarian assistance and disaster relief operations, and other areas such as explosive ordnance handling, flight line operations, and mishap response and prevention.